(CNN) -- Chinese actress Zhou Xun is a face recognized by millions, but so far, little known outside of China. The self-effacing 33-year old has recently graced the covers of China's editions of Harper's Bazaar and Elle magazines, but bringing her face to an audience away from China's mainland remains elusive. Zhou is demur on the topic of international acclaim, preferring only to say that she hopes to become a better actress rather than rival Zhang Ziyi as the face of Chinese cinema abroad. Her latest film is "Confucius" also starring Chow Yun Fat, but Zhou made her breakthrough on the big screen in 2000 appearing in "Suzhou River," and was soon hailed by the Chinese media as one of the country's four best young actresses along with Zhao Wei, Xu Jinglei and Zhang Ziyi. Since then Zhou has taken on a number of alternative roles -- from a nerdy lab technician in "All About Women" to an alcoholic spy in "The Message" -- that have marked her out from her peers and attracted plaudits from critics and fans. 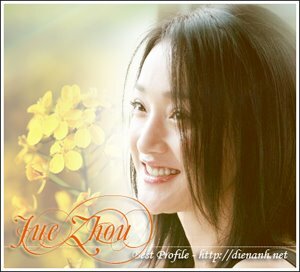 She won best actress awards at the Paris Film Festival in 2000 and numerous awards in China for her role in 2005 film "Perhaps Love" and more recently, "The Equation of Love and Death." Coming from a middle class family, she was a young girl at a dance academy when spotted by a film director and encouraged to become an actress. "Being an actress in China, I'm actually a very lucky actress... Especially now that Chinese movies are becoming more diverse with more viewers overseas," she told CNN. "I think it's the same to be an actress anywhere because the profession is about attitudes towards events -- it is a process to try to understand life. I think this is the case for actors across the world. "It all comes down to how you try to be a good person, and act responsibly." Acting responsibly, that is, except when the role demands it. Her clean-cut image was tarnished, on-screen at least, when she took a method approach to her part as a hard-drinking spook in "The Message." She admits to turning up on the set intoxicated in order to get into character. Even though she lends her face to a number of products and high-end brands, she's honest enough to admit she has her flaws in real life as well. "I think there are many faces to everyone. I also have my bad sides. Also I think everyone is trying to improve their shortcomings to become more wholesome. I have a lot of shortcomings, so it's 50-50," she said.